Gahnia siberiana is a large, robust clumping sedge usually found in damp areas . The stiff arching leaves arise from smooth sheaths and spiral around the stem. The leaves are like sandpaper due to small erect teeth over the surface. The leaves have rough edges which can cause a painful cut. 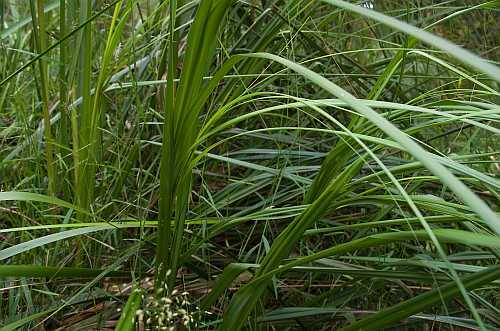 The tall arching stems and leaves of the red-fruited saw-sedge are seen to the left of the path in the damp areas. The flowers form loose chestnut brown panicles and the nuts are dark brown to black. The seeds were ground into a paste to make a simple bread. Saw-sedges are important, sometimes exclusive, food plants for caterpillars of several butterflies. They also provide safe habitats for small birds. Gahnia sieberiana grows 1.5–3 m tall and 2–3 m wide. It prefers moist soil but will withstand some drought once established, and is useful to help control soil erosion.